Since 1970 Carpet Trades has been your your local floor covering contractor in Melrose, MA! Call us today for the best in flooring product knowledge, price and installation at (781) 662-0062. Carpet - We invite you to visit our showroom and take samples home with you. We offer professional installation and our quality guarantee. Hardwood Flooring - ​Nothing adds beauty and value to your home like hardwood. We offer a variety of hardwood flooring options. Many of our products are environmentally friendly and use reclaimed or recycled hardwood. Our flooring experts can help you choose the floor that is right for your home. Laminate Flooring - Laminate offers an elegant look while being durable. Laminate has a softer, warmer feel underfoot and it is easy to maintain. It is also affordable and easy to install. Vinyl Flooring - is available in hundreds of colors and designs and has built-in protection against discoloration from mold and mildew. It is warm, quiet, durable, easy to clean and affordable. Commercial Flooring - Carpet Trades offers an extensive line of flooring for commercial use such as solid vinyl tile, sheet vinyl, hardwood and laminate flooring, as well as carpet. Carpet Cleaning - experienced carpet cleaning professionals use our state of the art equipment to revitalize and clean your carpets. 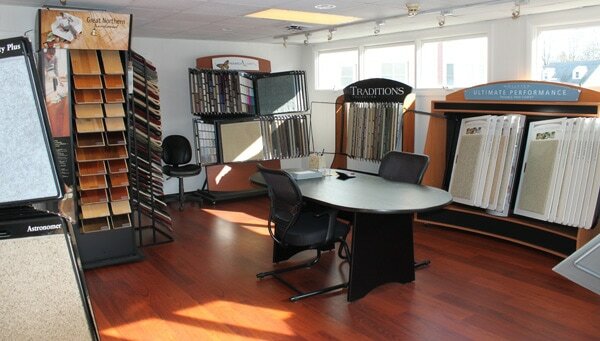 ​Carpet Trades located in Melrose, MA has been offering the best in product knowledge, price & installation since 1970. Our in-house installers are professional & courteous. We take the time to do the job right.